The Courier is a downsized version of our Sidekick Attache'. This versatile pack has a variety of uses. Use as a traveling companion, handbag, or small business case. The flap features a zippered pocket and easy-release buckle. 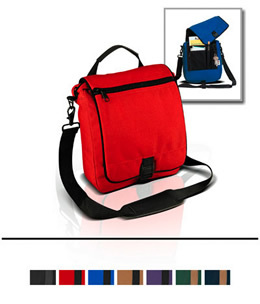 Concealed under the flap are a variety or organizer pockets and access to the main compartment. A leather padded handle and shoulder strap provide the final features for a truly functional accessory.